Isn’t every day a crockpot kind of day? I know today is! Even though I made this for Sunday night dinner, tonight is just as wet and icy. Which is crazy considering yesterday was 60 degrees and I was running outside before work. I said to the BOY that I don’t know of anyone else who uses their crockpot as often as we do. We had a cold and lazy weekend, so when I woke up Sunday morning, I immediately went searching through my cookbooks before heading out to the grocery store. With an ice storm heading our way, there was a chance that we’d be spending all day indoors (which is exactly what happened). For lunch, I made the most amazing Lentil Chili. Then after the Indiana game, the BOY helped me throw dinner into the crockpot. He chopped up the onion, red pepper, and chicken, and I told him he would definitely get props when I posted this recipe on the BLOG. I pulled out the food processor to make homemade peanut butter and then used it to make the peanut sauce. This recipe is perfect for two people because we were quickly able to get chicken and veggies in the crockpot and this sauce pureed in the food processor. I include this second picture just so you can see how liquidy the peanut sauce is. This worried me a bit, but everything thickened up in the crockpot. The other benefit of having a friend in the kitchen (besides the fact that I like hanging out with the BOY) is that they can take some action shots! So I should preface this by telling you that although I truly enjoy peanut butter, I’ve never been a huge fan of peanut flavored chicken when eating out. However, this dish is UN-BE-LIEVE-ABLE! The light peanut taste blends beautifully with the strong Asian flavors and hint of a kick! And if possible, I found this even better leftover for lunch! The flavors were stronger, and I ate slowly savoring each and every bite. Based on the BOY’s reaction, I definitely see this recipe getting moved into our monthly rotation, and I have been sharing the recipe with everyone I know. As a confused mother nature continues to throw thunderstorms, hail, snow, and ice our way, there is no better appliance than your slow cooker to create healthy comfort food! Let me know what you’ve been making to stay warm this winter and Stay Safe! 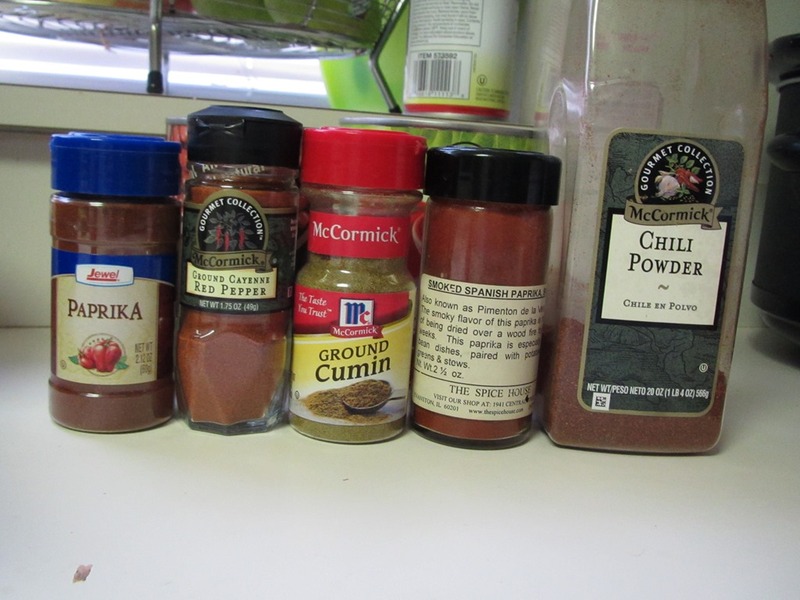 1/2 tsp red pepper flakes *can adjust or omit to change the heat of the dish! In the bowl of a food processor, combine the peanut butter, broth, tamari, lime juice, vinegar, garlic, ginger, honey, and red pepper flakes. Process until smooth, scraping down the sides as necessary, and set aside. Combine the onion, bell pepper, and chicken in the slow cooker and pour the sauce evenly over all. Stir gently to coat. Cover and cook on high for 3 to 4 hours or low for 5 to 6 hours until the chicken is cooked through but still juicy. Don’t overcook! I was finally able to sleep past 7 this morning (both Saturday and Sunday I was up at 7 for no reason and couldn’t fall back asleep), but I was afraid to get out of bed and see the state of my car. Luckily, the temperature was well on its way to today’s 40 degree high, so my car looked wet and not frozen. That’s a bonus! I had all of the ingredients needed to make Elixer, so that is how I started my day. I got a little overzealous with the cayenne pepper, but I was able to fix it and enjoy my morning beverage. This is definitely a spicy way to start the day, but I liked it. The only problem was that I started to overheat a little bit which may be secondary to the above mentioned 40 degree weather combined with our heat still being turned on and the cayenne pepper. Breakfast was Trader Joe’s frozen oatmeal with mashed banana and covered in homemade peanut butter. While I nibbled on my breakfast, I debated whether or not I should look up today’s WOD before CrossFit. I was curious, but sometimes I think the element of surprise is helpful with a tough workout. But…I checked it out anyways! Yikes! I might not be able to move my arms for a week. Just like last week, everyone was very friendly when I arrived. One of the benefits of the 9:30 Monday morning class is that it’s mostly women which I find less intimidating. We all got down to business when the clock started. I was surprised by how many pull ups/push ups I was able to do, but my arms were exhausted before I was halfway done. But I stuck with it, pushed a little farther, and was proud of my finish. One of the things that I like about CrossFit is that as everyone finishes, they stay and cheer each other on. One of the harder things for me is remembering to keep my form. I am all about alignment and preventing injury, which I had to remind myself as I was trying to crank out my last few reps each round. As expected, my arms felt like jello before I even walked out the door. I finally made it to get my oil changed before coming back home for lunch. I had an early lunch of leftover Lentil Chili, which was even better reheated today. A few hours later, I was watching Scandal and craving a green smoothie. Typically, I have a few favorite recipes that I use, but I got a new idea while flipping through the pages of Cooking Light magazine last night. This one involves ginger and apples with my favorite green leafy veggies. I would have loved to make green juice, but I didn’t know if my blender could handle it. So I added in a little almond milk with a few ice cubes to make a smoothie. It was a little thick and pulpy, but I loved it! One of the best green smoothies I’ve had in a long time. The addition of ginger is genius! As I look back through these pictures, it was definitely an awesome day of eating! I have a few more recipes from this weekend to share throughout the week, but for now I am logging off for a quick trip into the city. I need to go pick out a book for the train! Place all ingredients in blender and blend on high until everything is smooth. Drink fresh! There has been talk since yesterday of a big, dangerous ice storm heading our way. Yuck! When I spoke with my parents last night, they both said that we should plan on laying low today. When I woke up around 8am, the weather still looked fine, so I decided to head out to the grocery store for some staples before the expected 10am winter mix. I don’t think I have ever been to the grocery store before 9am. The store was quiet, which was nice, but the pharmacy didn’t open until 10am (which stinks before I needed some allergy meds). I was home before the BOY even emerged from the bedroom. The weather outside was gray, but warm. If a storm wasn’t heading our way, I might have bundled up for a run. Instead, I put some errands on hold to stay in my warm, comfortable home. I made us some eggs for breakfast and sat down to watch last week’s Biggest Loser. Meanwhile, I got started on moving some files form old computer to my new computer. 2 hours later, there was no wintery mix insight, and I was beginning to feel guilty about sitting on the couch in my jammies all day. My mom called around noon and mentioned that some rain had started by their house. She invited us over to brave the storm with some television and chili. However, I had the same idea here! The BOY turned on the Indiana basketball game, and I started chopping up veggies for Lentil Chili. This is a vegetarian recipe from one of my new cookbooks. I was super excited to try this chili. It has a complex flavor profile, and I even picked up cayenne at the grocery store this morning. This chili is jam packed with vegetables! Before you even add in your lentils, beans, tomatoes, and veggie broth. I used only 4 cups of broth due to space limitations in my pot. If I was going to spend the day, hiding from the rain, I decided to make the most of it. I kept plugging away at my computer getting to know Windows 8 and started a few loads of laundry. I also sat with the BOY cheering on Indiana during a stressful conference game. By the time Indiana secured a victory against Michigan State, my chili was ready for consumption. So simple and rich, the chili tasted amazing covered in sweet avocado. I recommend saving this recipe for your next rainy Sunday (or even Superbowl Sunday)! The rain never came down as hard as I expected, but a few minutes ago, the BOY looked out the window. And my car…is covered…in a sheet of ice. Yikes! I will definitely have to thaw it out in order to get to CrossFit tomorrow. Did you get hit with a winter storm today? Mine was much lazier than expected, but I am happy to be moved into my new computer! If you are having a quiet day in (like me), here are three more veggie chili recipes that I love! And…dinner is already in the crockpot, which means that I will have another easy recipe coming your way. Clue…this one involves homemade peanut butter! In a large soup pot over medium-high heat, sauté onion, celery, carrots, bell pepper, and garlic in 1 cup of the vegetable broth. 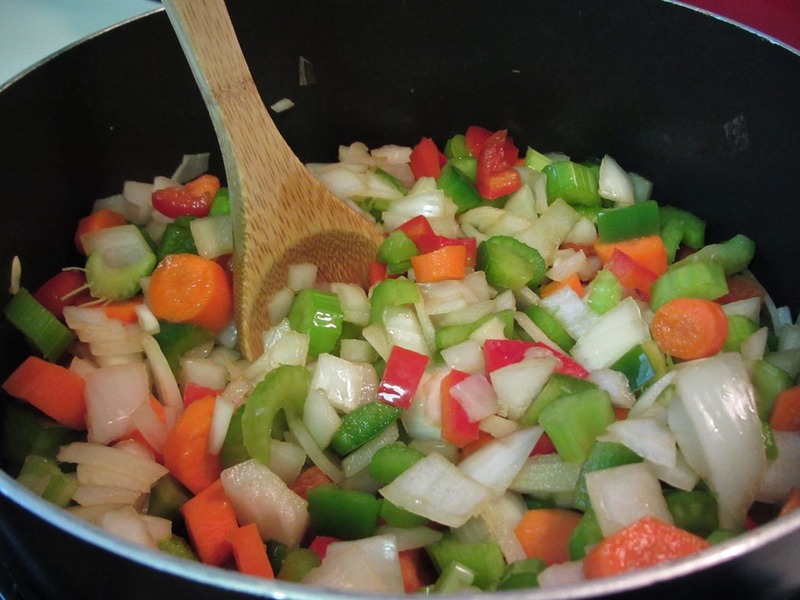 Stir occasionally and cook until vegetables soften, approximately 5-7 minutes. Add chili powder, cumin, paprika, ground chipotle powder, and cayenne pepper and cook for an additional minute, stirring well. Add lentils, crushed tomatoes, kidney beans, and remaining vegetable broth into the soup pot. Cover and bring to a boil. Cover and bring to a boil. Once boiling, reduce heat and simmer until lentils are soft, approximately 45 minutes, stirring occasionally. *Note: this recipe made 12 cups of chili, which is more than enough to eat, share, and try freezing. Before I even start this post, I should warn you that this is my first time attempting to use Windows Live Writer on my new computer. I have no idea how it will work because the BOY set everything up for me, and he doesn’t even know the name of my blog…LOL! One of the things I still haven’t done is move my pictures and Eye-Fi onto this computer. I am so spoiled because my photos automatically upload, but I haven’t switched that around yet. It’s on my list of things (along with update music and take car for an oil change) to do this weekend. I must say that snow is much more beautiful in the day light and when you don’t have to commute to work. The BOY and I were both up earlier than expected this morning. After a simple breakfast of banana walnut oatmeal and Elixer, I hit the road for Hot Yoga. The class was warm, intense, and rewarding. I felt strong in my balance poses, lightness in Warrior II, and utter fatigue in chair pose. I know that I have mentioned this before, but I really do feel different when my diet is clean. After yoga, I picked up Mediterranean for lunch. Our favorite place just happens to be on my way home from the studio. Although their pita is amazing, I knew I had some sprouted wraps and homemade hummus at home. I ordered my favorite Fattoush salad with grilled chicken with plans to create a half homemade lunch that was clean and satisfying. While the BOY dug right into his lunch, I created 2 grilled chicken wraps. One with garlic hummus and the other using this new Roasted Red Pepper Spread from the Forks Over Knives Cookbook that I whipped up earlier in the week. Both wraps turned out incredible! With my salad on the side, even the BOY commented about how good my lunch looked. I’m sorry I didn’t get more pictures, but after this morning’s workout, I was starving! I will tell you that this spread is really easy and versatile, and I would recommend using it to spice up your sandwiches. I’m heading upstairs to pack and take a nap before heading into the city for a bachelorette party tonight. See you tomorrow! How do you eat clean on the weekends? Do you ever make ‘half homemade’ lunches? Combine all ingredients in the bowl of a food processor and puree until smooth and creamy. And I’m not talking about my new computer. Ok, obsession is probably too strong of a word. But I have a new favorite AM beverage…hot water with lemon! Over my winter break, I read that it was a good way to start your day because of it’s detoxifying principles, so I decided to give it at try. Shortly there after, I noticed hot lemon water popping up on numerous blogs. I was intrigued…was there more to this than I realized? Or does everyone just love the taste (like I do)? Then a few nights ago, Whole Living magazine shared a recipe for elixir as part of their 3 week new year cleanse. Their version included lemon, ginger, turmeric, and honey to taste. Since I don’t love honey, I left it out. I was nervous to try this odd combination, but pleasantly surprised with how refreshing and tasty it was. I think I will pick up some fresh ginger this weekend because I have heard that it is even better. I have no idea how detoxified I actually am, but overall, I am feeling really GOOD! I am working to decrease my stress levels, eating clean, and figuring out a new winter workout routine. At the risk of getting too personal, I am also highly pleased with my Good Belly probiotics. Without oversharing, I can tell you that since starting to take this probiotic a few weeks ago my stomach has felt fantastic. I was even able to have some Yogurtland without a flare up. Awesome! I would have told you that I was skeptical about probiotics, and now I am a huge fan. I drink one every morning before my lemon water and breakfast. And hot lemon water is totally necessary when this is the start to your Friday morning! BTW, if all of this talk about working out is making you hungry, feel free to make one of these amazing peanut butter recipes in honor of yesterday’s National Peanut Butter Day. It’s never too late to celebrate…right?! In a mug, stir together water, lemon juice, turmeric, ginger, and cayenne and honey to taste until combined. Do you drink hot lemon water? Why? Like I said, I am intrigued by this new health trend! Does anyone else take probiotics? What do you think? I am writing to you from my couch to wish you a a wonderful day dedicated to this addictive and delicious food! Why my couch? Well, let’s see…Monday was CrossFit, Tuesday 90 second running intervals along the indoor track, and this morning another indoor track for a 45 minute run! Needless to say, my body is screaming at me! I have muscles that I didn’t even know existed that ache, but I feel GREAT! Welcome back to strength training. I wasn’t able to fit another CrossFit or Hot Yoga into my schedule this week, but I more than made up for it with running. So…back to the real reason for this post…Peanut Butter! Or more specifically National Peanut Butter Day. I’d recommend starting with your own homemade version. Then use it in one of the amazing recipes below. What is your favorite peanut butter recipe? Remember my excitement over Yogurtland?! The BOY and I ran some errands Saturday afternoon. As we pulled into the FedEx parking lot, the he mentioned that Yogurtland was opening today. Even though we hadn’t eaten lunch, we decided that yogurt was totally necessary. The place was really crowded and the BOY and I walked right in to the back to check out the flavors. Along with the tart Greek yogurt, there were a few fruit flavors. The BOY and I went straight for the good stuff, filling a large cup with s’mores, pistachio, vanilla, and red velvet cupcake. The perfect pre lunch treat. We tossed on some cookie dough bites because who can walk past cookie dough bites without grabbing a few. Feeling like frozen yogurt experts, the BOY and I walked up to the register, placed our cup on the scale, and got the strangest look from the girl working behind the register. The BOY and I were super confused when she looked up at us and said ‘It’s Free!’. Free yogurt…could life get any better? We assumed it was an opening day special and the apparent owner next to us confirmed that for the first hour the yogurt was free. Thinking that we should most likely head back for some more, I mean why share one cup of yogurt when it’s free, the owner kindly stated that this was a private event. All of a sudden, the BOY and I looked around and saw that the people talking seemed to know each other. And we totally crashed their party. The BOY and I offered to pay for our yogurt but they said it wasn’t a problem. We stepped out of the store and completely fell apart with laughter! Talk about being totally oblivious. I think we just robbed the Yogurtland! We reassured the owner that we’d be back often and would definitely pay for our yogurt in the future. And after sampling our selection, I am sure we will go back. The yogurt was excellent! I’m not sure if it’s because I haven’t had much dairy in the past few months, or because frozen yogurt is my favorite food ever, but we loved it and licked every last drop off our spoons in the car. The whole scene was hilarious! I can’t stop smiling when I think about it! It reminds me of our shenanigans in Florida last spring.